Preheat oven to 350°F (180°C). Spread walnuts on a baking sheet or in a shallow pan. Bake, stirring once or twice, until lightly browned and fragrant, 5-10 minutes. Let cool. Leave oven set at 350° F (180°C). 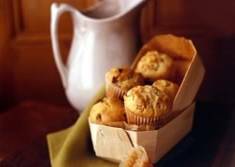 Line 14 to 16 (2-1/4 inch) muffin cups with paper baking cups or coat with vegetable oil spray. In another large bowl, whisk together buttermilk, brown sugar, butter, eggs, and vanilla. Stir berries and 1/2 cup of the toasted walnuts into buttermilk mixture, then stir in flour mixture just until dry ingredients are moistened (do not overmix). Spoon batter into muffin cups, filling each about three-fourths full. Sprinkle muffin tops evenly with remaining 2 tablespoons walnuts. Bake until a toothpick inserted into the center of a muffin comes out clean, 20 to 25 minutes. Cool 5 minutes in the pans, then transfer to a wire rack. Serve slightly warm or at room temperature.